Neenah, WI - The Wellness Council of America (WELCOA), with local affiliate Wellness Council of Wisconsin (WCWI), recently presented its coveted Platinum Well Workplace Award to J. J. Keller & Associates, Inc. – the nation’s leading provider of regulatory, safety and compliance solutions. The Platinum Well Workplace Award recognizes an organization for its commitment to the health and well-being of their employees. J. J. Keller offers many unique benefits to associates, all under the umbrella of the company’s LIFE wellness program. This includes many popular health benefits, as well as two on-site health clinics, where associates are able to see a healthcare professional conveniently during the workday – for free. Spouses who are covered by the J. J. Keller health plan are also able to visit a LIFE clinic for free. In addition, common prescriptions can be issued and filled o site – for free. On any given day on the corporate campus in Neenah, Wisconsin, you will see associates using the company’s on-site fitness center, walking on the mile-long trail around the grounds, eating at one of the company’s two chef-run healthy cafés, practicing mindfulness, participating in a wellness challenge, and more. “J. J. Keller has clearly demonstrated their commitment to protect and enhance the health and well-being of their employees. 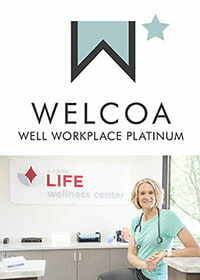 By meeting the comprehensive standards necessary to achieve the Platinum Well Workplace Award, J. J. Keller is prioritizing the well-being of their employees as a foundation of their culture,” said Wellness Council of Wisconsin’s Executive Director Marissa Kalkman. J. J. Keller earned the Platinum Well Workplace Award, which is a three-year designation, in 2013, as well as Gold and Silver Well Workplace Awards in 2012 and 2009, respectively.